This is a great looking double sided porcelain neon sign. The sign measures 48″ by 38″ and is dark green, light green, and orange. The sign is a die cut porcelain sign. 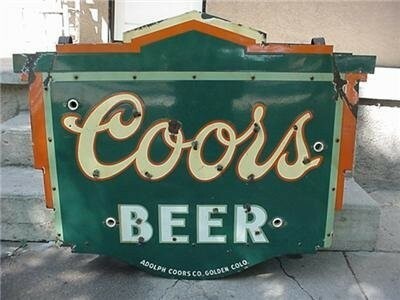 In the center of the sign is the text that reads “Coors Beer Adolph Coors Co. Golden Colo.” “Coors” is written in a nice logo script.